CJ: How can ACS members interact with ACS Careers staff? What are common complaints, etc.? What are things that ACS members really appreciate? DH: The easiest way for ACS members to contact the ACS Careers Staff is by writing to careers@acs.org. The Careers Team receives both positive and negative emails from members and other job seekers. Negative emails are generally focused on the frustrations associated with the job hunt. People may want more job listings in a particular job category, salary range, and/or geographic region. Where possible, we try to accommodate these requests by contacting employers with corresponding listings. However, the reality is that we cannot manufacture jobs. In the end we are limited by market demands. Thank goodness, we also receive thank you notes. Helping people find employment, especially in a tough economy, is a hard job. Still, it is rewarding to know that you are able to help in some small way in the process. Thank you notes generally focus on the services provided by our volunteer career consultants or the resources provided through our website: www.acs.org/careers. We also receive many positive comments through the ACS Careers Blog and the ACS Careers Industry Forum. What would ACS Careers staff most like to hear about/from ACS members? I would most like to know about what works. How are others overcoming barriers and finding opportunities? The most powerful thing about an association is the ability to share information. If we are able to find out about strategies that worked for the job search process, we can communicate them to others through our blog and/or the ACS Network. Most recently, one of our career consultants wrote a knol about the many ways that Google tools can be used in the job search process. Her knowledge has proven useful to many others, and her knol has become one of the most searched career resources at Google. I also want to know about things that are going wrong. Our team can’t fix a problem unless we know it exists. Recently, Chemjobber alerted us to a phishing scheme in the jobs database. We were instantly able to pull down the listing and work with our vendor to enhance our restrictions and firewall protections. Our mission at ACS Careers is to help ACS members gain employment; to help them keep their jobs; and to prepare them for the many career transitions that they are bound to face. Any communications that helps us to further our goals are welcomed and encouraged. Are there any efforts by ACS Careers to expand their web presence? The RSS feed is handy. Yes, we are constantly developing new resources and making them available through our websites. Our greatest challenge at this point is integrating the websites that we currently provide. Our job listings and career consulting services can be found through the jobs database site (chemistryjobs.acs.org), while most of our career resources are located at www.acs.org/careers. We also have online and facilitated learning opportunities through the ACS Center for Professional Development and the ACS Professional Training websites. And lastly, the ACS Careers Blog is located at acscareers.wordpress.com. Most recently, we added the first in our Career Caffeine video series. This first video focuses on the job search process. Two more videos are in production for the topics of writing a resume and interviewing. Self study guides and group discussion guides have also been developed for the job search, resume writing and interviewing processes. All of these resources are available through the Job Search Essentials page on www.acs.org/careers. What is the process for getting an ad on ACS Careers? For a job listing, employers use an automated system very similar to the one used by job seekers. The potential employer creates a profile for the company and enters the text for their advertisement. They also select appropriate categories for the job such as inorganic, green and/or senior level. To post the job listing, they choose a term of service and either pay by credit card or choose to be invoiced. The fees generated through this process help pay for services offered to our members. The fee structure also helps to ensure that job listings are legitimate. Although ACS charges employers for job listings, there is no charge to job seekers for any of our services. Are ads vetted by an editor before posting? 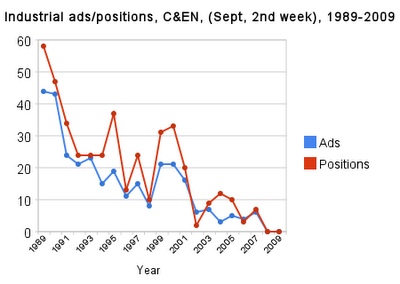 Listings that are published in C&EN undergo review before publication; however, online job listings generally do not. The online job posting system is automated in order to keep the posting process timely. Employers generally expect their job listings to be posted as soon as they complete the e-commerce process. If complaints about a listing are received, the posting is reviewed immediately and it may be removed or modified at the discretion of ACS staff and legal counsel. In cases where illegal or questionable activity is detected, listings are removed and employer profiles are blocked to protect our users. Our service provider, Boxwood Technologies, also monitors postings and traffic patterns to detect illegal activity. All user records are protected in accordance with the highest industry standards including PCI compliance. What is the relationship between Kelly Scientific Resources and ACS Careers? Do they pay for ad space? The ACS Committee on Economic and Professional Affairs recognized the only way to apply for entry-level positions at many chemical and pharmaceutical companies is through staffing or placement agencies. Some companies, especially larger ones, have outsourced their screening and on-boarding processes to professional staffing agencies. The Committee recommended that ACS develop relationships with one or more staffing agencies in order to provide a route into entry-level positions at major chemical and pharmaceutical companies. Negotiations were begun with several firms; however, Kelly Scientific Resources was the only staffing agency who both applied and was able to meet all of the requirements set by the Committee in terms of hiring and compensation practices. Kelly Scientific Services pays an annual fee to ACS to place their job listings within the ACS Careers Jobs Database. They also provide job placement and career counseling services to ACS members upon request. Additionally, they provide informational seminars at ACS national and local meetings as requested. What's your prediction for when the job market for chemists will pick up? Any 'green shoots' that you're aware of? I must preface this answer by stating that I am not an economist. I am a chemist. I must also state that this is my own opinion and it does not reflect the views of the Society. It should not be used as the basis for any financial or other transactions. Today’s Financial Times has a story on the cover which quotes Ben Bernanke, US Federal Reserve chairman, as stating that the US recession “is very likely over,” but I think that it will be six to eight months before we will see changes in the US chemical and pharmaceutical job markets. Most chemical companies are still highly leveraged with large inventories on hand. They are not likely to start hiring again until those inventories are reduced and production starts. The pharmaceutical industry does not have the same problems with regard to inventory surpluses, but their hiring practices have also slowed due to mergers and acquisitions (M&A). The M&A process generally takes one to three years to complete. During the first year, there is generally no hiring and layoffs are common due to the elimination of redundant positions. The good news here is that we are about 6 to 8 months into the very large M&As of 2008 and 2009. The job market for chemists should start to thaw next spring. In the mean time, we may see additional layoffs as companies compensate for poor market performance and those involved in M&A continue to eliminate redundancies. Good morning! Including September 11, there have been 104 new jobs posted on the ACS Careers website. Of those, 58 are from our friends at KSR and 28 are academic faculty positions. There they go again! : Genentech is looking for B.S. or M.S. synthetic chemists for their medchem program. I feel like they've done this before, but hey! it's the Bay Area. Good luck! There's the stimulus! : The National Renewable Energy Laboratory is looking for a M.S. chemist to apply NMR technology to biomass conversion. That's a little unexpected, but it sounds cool. Kelly Time! : Say it with me, folks: are you a chemist? Do you like doing chemistry? Kelly Scientific Resources wishes to know if you'd like being a registered nurse or perhaps a manufacturing operator. Sigh. How's this for a bit of depressing news? 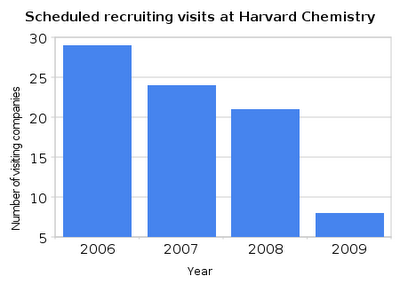 You can find the recruiting schedule for Harvard's Department of Chemistry and Chemical Biology here. Handily, they have the recruiting schedule for the last 3 years, too. I tabulated the schedules here* and came up with this little graph you see above. That's the ugly truth, folks. If they ain't hiring folks outta Harvard, they're not hiring anywhere. Let's see where we get in 2010 -- remember, unemployment is a lagging indicator. Good morning! Since September 1, there have been 191 new jobs posted to the ACS Careers jobs database. Of those, 49 are from our friends at Kelly Scientific Resources. Do you want to be a professor? : There have been 77 faculty positions posted in the last 11 or so days. That's remarkable -- I imagine it's also going to be a healthy sign for the academic recruiting issue of C&EN. Good luck, postdocs. For the rest of us: Bugs, polymers and fuel cells -- that's what Lawrence Berkeley Labs is looking for in a Ph.D. chemist staff scientist. If electrochemistry is your field, this may be a job for you. That's an interesting combination: Sandia National Labs is looking for a B.S. chemist to help with computer modeling in biofuels and neurosciences. I'm guessing those are the folks who are funding the position? "Hyperspectral Imaging" -- sounds very Star Trek, doesn't it? Inorganic chemist wanted, real science wanted? : Blacklight Power (home of the "hydrino") is looking for a Ph.D. inorganic chemist. I'm pretty skeptical of their science, but they're hiring, I guess. Must love college basketball: If you're a B.S. analytical chemist with 6 years of experience (or a M.S. with 2) in HPLC analysis, there's a job in North Carolina for you with Targacept. Kelly Time! : Are you a chemist? Do you love doing chemistry? The geniuses at Kelly Scientific Research want to know if you can be a "psychometrician rater", a pharmacist or a entry level microbiologist. Sounds like a good fit for me! While I won't get off my KSR hobbyhorse anytime soon (considering they make up 26% of the take from ACS Careers), I have noticed that their postings are becoming more relevant as of late. Week to week trend: Flat, like Kansas. Where will workers find jobs now? Small college of the week: Mt. Holyoke College (South Hadley, MA, student population: 2,100 - SA-LUTE!) is looking for a tenure-track assistant professor who has a speciality in either bioorganic or biophysical chemistry. That sounds fun to me. Week to week trend: Flat as a pancake. Week to week trend: Up, big. Not a good week to be looking for an industry job: De nada. Small college of the week: The University of Southern Maine (Portland, ME, student population: 10,974 - SA-LUTE!) is looking for a tenure-track assistant professor in biochemistry. Like lobster? This position might be for you! Good morning! Including August 22, there have been 167 new jobs posted on the ACS Careers website. Lots of odd jobs, not so many permanent positions. Computational chemist desired: Cubist Pharmaceuticals is looking for a PhD computational chemist with 5-7 years of experience. Sounds like a company on its way up, with a couple of products under its belt. There's our stimulus funds! : Argonne National Labs is looking for a PhD electrochemist to do studies on lithium ion batteries. I think it's a good time to be a battery specialist -- what do you think? Do you get discounts on contact solution? : Alcon is looking for an experienced analytical chemist to support a surgical R&D team. Sounds pretty cool. M.S. or Ph.D. with experience desired. Kelly Time! : Are you a chemist? Do you like to do chemistry? Kelly Scientific Resources wants to know if you are a bilingual nurse, can do biostatistics calculations or if you want to leave the bench to be a procurement manager. Awesome!